The mighty and magnificent Journey have teamed up with the equally epic Doobie Brothers for a co-headlining tour that will take you down the rocky road that is memory lane! The Bay Area superstars will be heading to Farm Bureau Live on Friday 1st July for a night packed with hits and a show you'll never forget! Journey began in 1973 in San Francisco. In their five decade spanning career, the band has earned nineteen Top 40 singles, two gold albums, eight multi-platinum albums, and one diamond album. They originally started out as a progressive rock/jazz fusion act known as the Golden Gate Rhythm Section, comprising of former members of Santana and Frumious Bandersnatch, but the group changed their name a few years later and shortly after gained a recording contract with Columbia records. Their first three studio albums were released in 1975, 1976 and 1977 respectively, but it was 1978's Infinity that lead them on their path to stardom. With a new lead singer, a new producer and a new more pop/rock influenced sound, Journey went on to have seven consecutive multi-platinum albums from 1978-1987 and released a string of hit singles including 1981's Don't Stop Believin', which in 2009 became the top-selling track in iTunes history amongst songs not released in the 21st century. 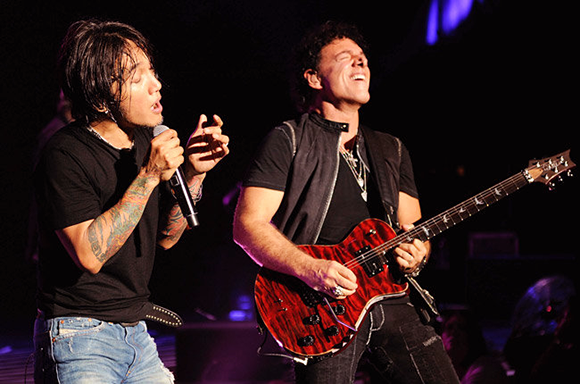 Their worldwide sales have reached close to 90 million records, making them one of the world's best-selling bands of all time, and Journey ranks No. 96 on VH1's 100 Greatest Artists Of All Time.